BaseElements is designed to be familiar to anyone who is a FileMaker Developer. We've stuck with well known FileMaker conventions where possible and tried to use as many native user interface controls and methods. A couple of basic tips : First it's just FileMaker, so you can create new windows and switch between form and list at will. 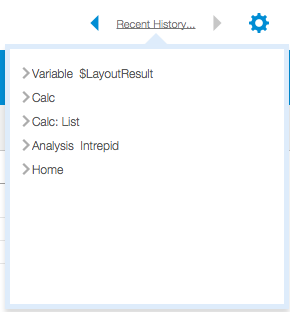 A sample use case might be to go to a list of related items, which automatically switches to list view. You can then open a new window, and keep that found set for later. Switch back your old window and use the back and forward buttons to go back to old layouts. The find interface isn't modified at all, you can do regular finds as well as constrain or extend, and because you have field access, you can right click for "Find Matching Records" as well as context dependent sorting. It's all just standard FileMaker. The buttons are the Back, History, and Forward buttons respectively. The back and forward is to track your history in BaseElements and to be able to back track to a previous layout and record. The back and forward will remember the layout, tabs and record that you were on previously. It doesn't remember your found set or sort order though, so be aware if you go back to a record that isn't in the found set you will alter the found set to include it. If you've gone backwards, you can then also track back forwards. Once you link somewhere though, the forward is cleared out, in much the same way that a web browser would. This is a scripted back process, so it records only when you navigate via a button inside the UI. If you manually choose a layout from the layouts menu it isn't included in the back history. The history button shows you the last 10 places in it's log, so you can go to any one of them directly. The New Window function is such a useful way of keeping a found set for later, it's been mapped to the Command-N keyboard shortcut. There is no need to create new records in BaseElements as they're all created via import, so this is a convenient shortcut. This is the main starting point for any solution. The counts for each item can be clicked on to go to the list of those items. This is the best starting point for looking at any solution, you can jump to a list of the items you want to look at with one click.